Radiofrequency radiation injures trees around mobile phone base stations. to trees in the vicinity of phone masts. The kinetics of the acquisition and loss of the use of olfactory and visual cues were previously obtained in six experimental colonies of the ant Myrmica sabuleti meinert 1861, under normal conditions. In the present work, the same experiments were conducted on six other naive identical colonies of M. sabuleti, under electromagnetic radiation similar to those surrounding GSM and communication masts. Can electromagnetic high frequencies be so harmful that they represent a cause of illness for our house pets and for ourselves? Birds are famously good navigators. Some migrate thousands of miles, flying day and night, even when the stars are obscured. And for decades, scientists have known that one navigational skill they employ is an ability to detect variations in the earth’s magnetic field. How this magnetic sense works, however, has been frustratingly difficult to figure out. Now, two researchers at Baylor College of Medicine, Le-Qing Wu and David Dickman, have solved a central part of that puzzle, identifying cells in a pigeon’s brain that record detailed information on the earth’s magnetic field, a kind of biological compass. The worldwide maintenance of the honeybee has major ecological, economic, and political implications. In the present study, electromagnetic waves originating from mobile phones were tested for potential effects on honeybee behavior. Mobile phone handsets were placed in the close vicinity of honeybees. The sound made by the bees was recorded and analyzed. The audiograms and spectrograms revealed that active mobile phone handsets have a dramatic impact on the behavior of the bees, namely by inducing the worker piping signal. In natural conditions, worker piping either announces the swarming process of the bee colony or is a signal of a disturbed bee colony. KOCHI: They don’t use cell phones; yet they may be its worst victims. Next time you read a report on birds falling prey to radiation and consequently getting sick, you might as well guess that a cell phone tower could have caused it. It is not just humans but birds and bees too are beginning to feel the impact of ‘electro-smog’, the pollution from the electromagnetic fields (EMF). The effects of pulsed radio frequency electromagnetic field (RF EMF) on plant growth and development are still unclear and contradictory. The aim of this work is to study the impact of RF EMF generated from the Skrunda Radio Location Station, Latvia, on growth and development of pine trees. Pine needles and cones were collected in 1993 from the tops of SO-60-year-old pine trees in four locations near the Skrunda RLS: A - no EMF exposure, B - low EMF exposure, C and D - high EMF exposure. The chloroplasts of mesophyll of second-year needles are ultrastructurally characterised by dense stroma, a compact granal membrane system and variable amounts of starch granulesa nd plastoglobules. themselves and which perform vital functions in their normal day-to-day metabolism and growth. We will then go on to see how weak electromagnetic fields can disrupt these and bring about many unwanted biological effects. There are some very interesting pieces of research and anecdotal evidence related to possible physiological effects of EMFs. • Hertel HU, Wattenwil S: ‘Der Wald stirbt und Politiker sehen zu’, raum&zeit, Nr. 51/91, Ehlers-Verlagpp. 3-11 (The forest dies and politicians watch) Attached and link below. Dr Hertel’s work also includes photographs and maps of an apparently effected areas, with the photos showing what is alleged to be damage to tree growth caused by microwaves – with markedly different ring profiles noted on different sides of the cross-sections taken through the trunks. Lines of deforestation followed line of transmission. Though there are other possible explanations for some noted occurrences such as the light and shade the trees have been exposed to in the past and geoelectromagnetic anomalies affecting growth patterns and die-back, the research seems highly competent and worthy of further investigation. • Damage to trees – forest dying Observations and pictures. With bibliography. • Tree damage from chronic high frequency exposure? ‘The three lime trees’ that speak for themselves. Requires a lot more observation, and observation relating to onset of transmission and onset of die-back needs to be done. The Skrunda Radio Location Station (RLS), which has operated continuously for more than 20 years, has created a unique area for the study of pulse radio-frequency electromagnetic field effects. Trees were chosen to assess these effects. Since 1990, permanent plots have been established in pine forest stands around the Skrunda RLS and in control areas. The dynamics of tree growth changes were analysed using retrospective tree ring data. There is a statistically significant (P < 0.01) negative correlation between the relative additional increment in tree growth and the intensity of the electric field. The radial growth of pine trees has diminished in all plots that received electromagnetic radiation. This decrease in growth began after 1970, which coincided with the start of operation of the Skrunda RLS, and was subsequently observed throughout the period of study. The effects of many other environmental and anthropogenic factors were evaluated, but no significant effects on tree growth were observed. It was estimated in 2009 that the carbon dioxide emissions produced globally by the telecoms industry released 110.7 million tonnes of Co2 into the atmosphere. That is equivalent to emissions from 29 million cars. ( Bennett 2009 ). A review on the impact of radiofrequency radiation from wireless telecommunications on wildlife is presented. 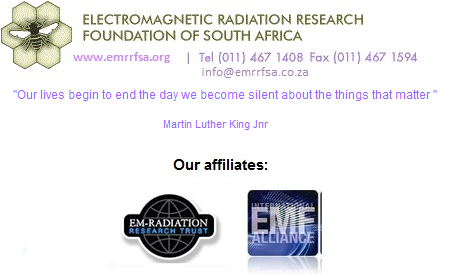 Electromagnetic radiation is a form of environmental pollution which may hurt wildlife. Phone masts located in their living areas are irradiating continuously some species that could suffer long-term effects, like reduction of their natural defenses, deterioration of their health, problems in reproduction and reduction of their useful territory through habitat deterioration. Electromagnetic radiation can exert an aversive behavioral response in rats, bats and birds such as sparrows. Therefore microwave and radiofrequency pollution constitutes a potential cause for the decline of animal populations and deterioration of health of plants living near phone masts. To measure these effects urgent specific studies are necessary. As a result of the Chernobyl accident, tens of thousands of hectares of forests have experienced massive radioactive contamination, located in the immediate vicinity of the Chernobyl NPP and stretching approximately two kilometers west of the station. These were mainly single-crop plantings of Scotch pine (Pinus silvestris). Signs of radioactive mutation of conifers are already evident, having absorbed approximately 100 doses. It should be noted that the main radiation fallout on the pines resulting from the Chernobyl accident occurred during the revitalization process of plant growth. In such a period the radiosensitivity of plants increases 1,5–3 times as compared to other periods. The crown of fairly dense pines acts as an effective filter, which helped delay the effects of large quantities of radioactive dust and aerosols in the crowns of these trees. Pine needles are typically not dropped for 2–3 years, causing a slow natural cleaning of crowns as compared with hardwood trees. This factor increased the radiation effects on coniferous trees compared to other breeds. The question of causal effects and biological relevance of electrical and magnetic parameters is generally posed without simultaneous reference to their relevance to life’s organisation. These questions cannot, however, be considered in isolation of each other. There are at least two possible reasons of the mass death of the birds. The first reason is a microwave radar. Microwave radiation from the powerful radar, even at a distance of several tens of meters can significantly heat air. Does wi-fi radiation cause tree deformities? New research conducted at Wageningen University in the Netherlands concludes that wi-fi signals might damage nearby trees, causing them to develop severe abnormalities in their bark and leaves. The great migrations start. Thousands and thousands of creatures go to the places where their ancestors have always gone to sit out the winter and come back in warmer weather. But how do they know where to go? Migratory birds use a combination of methods to navigate like landmarks and seeing the position and light of the sun and stars. Now there is evidence that magnetic fields play an important role in navigation. According to the study, translated from Dutch using Google Translate, trees in urban areas of the Netherlands showed an increasing number of damage such as cracks, bumps, discoloration and various forms of tissue damage. My name is Dr Reese Halter, I am a practicing conservation biologist specializing in tree physiology with over two decades of experience in both the Northern and Southern Hemispheres. Currently, I am stationed at Cal Lutheran University in Thousand Oaks, Calif. I’m also the founder of Global Forest Science an international conservation institute with operations in 8 countries. I oversee approximately 165 scientists. I am also a prolific writer and one of my books, The Incomparable Honeybee and the Economics of Pollination, Rocky Mountain Books, documents the known deleterious hazards of high frequency electro-magnetic radiation from cellular towers on honeybees. This year alone North America is missing at least 55 billion honeybees from a mysterious disease called Colony Collapse Disorder. Firstly – the problem is sudden and global, suggesting it is a global source; the coincidence here is the tripling of global microwave background radiation. Secondly – normally with a disease or virus the bees die within or near their hives, but now, in most reported cases, the bees are simply disappearing. Will the Communications Industry be the Final Straw For Our Planet’s Ecosystems?